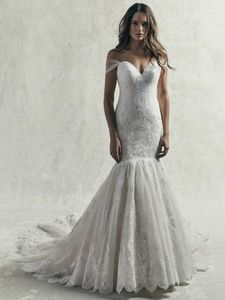 Description: Sensual and romantic, this mermaid wedding dress features allover lace motifs atop textured tulle, cascading into a fit-and-flare skirt and statement train. A lovely tulle ribbon comprises the off-the-shoulder sleeves and lace-up corset, accenting the sweetheart neckline. Finished with corset closure, with option of a half modesty panel (finishes at waistline) or full modesty panel beneath the corset. Also available with covered buttons over zipper and inner elastic closure. Detachable tulle and lace cap-sleeves sold separately.